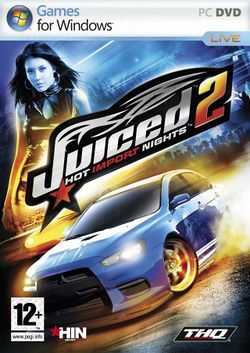 Juiced 2: Hot Import Nights is a Racing video game released on September 25 for the PlayStation 2, PlayStation Portable, Xbox 360 and Nintendo DS. The Windows version was released on October 31, 2007 and the PlayStation 3 version was released on October 29, 2007, though it was originally set for release at the same time as the other versions. It is a sequel to the 2005 game Juiced. This game is being developed by Juice Games and published by THQ. It utilizes more advanced car modification methods in comparison to its predecessor. A demo for the Xbox 360 version was released on the Xbox Live Marketplace on July 19, 2007. A second, multiplayer demo appeared on September 14, 2007. Ursula Mayes is on the cover of the game on all platforms. This page was last edited on 30 May 2016, at 05:34.